The pair rebounded from the level of 50%, but, against my expectations, the market didn’t start a new ascending movement. Now all that is left to do is open short-term sell orders. Most likely, the bears will reach the level of 1.3000 by Friday evening. At the H1 chart we can see, that after making a rapid descending movement, the pair is consolidating. There are three fibo-levels in the target area. According to the analysis of temporary fibo-zones, predicted levels may be reached by the end of Friday. Franc has almost reached the level of 61.8%. The target for the next several days is the level of 0.9400. If the pair breaks this level, the price will continue moving towards new maximums. 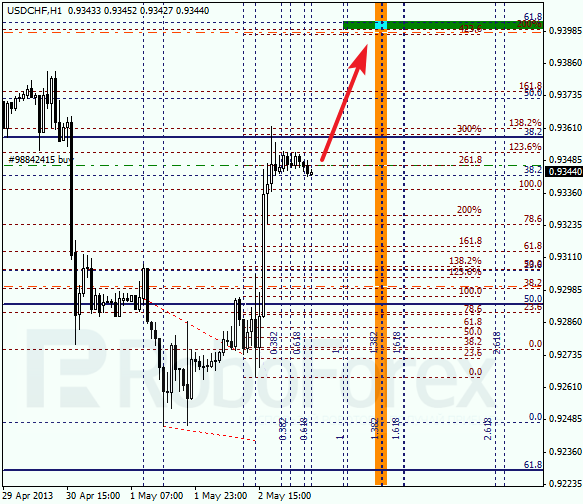 At the H1 chart we can see that there are three fibo-levels in the target area. According to the analysis of temporary fibo-zones, the target area may be reached during the next several hours. If the pair starts an unexpected descending correction, I’ll close my short-term buy order.